Ii retired from retail after 42 years then went to work in construction. Yes, girls can drive heavy equipment as well as other task like caulking, painting, etc. Anyway, during a brief downtime at lunch one day, i spotted a stack of pallets. I ask the superintendent what they were going to do with them. I've always been into recycling and these pallets gave me all kinds of possible ideas. I had even checked out pinterest and and thought if only i could get my hands on some of those pallets. well.. I spoke with my husband then talked him into helping me get them home. Over the winter I've been very busy. The table I built including bread boards is 37 1/2 inches wide x 83 inches long. 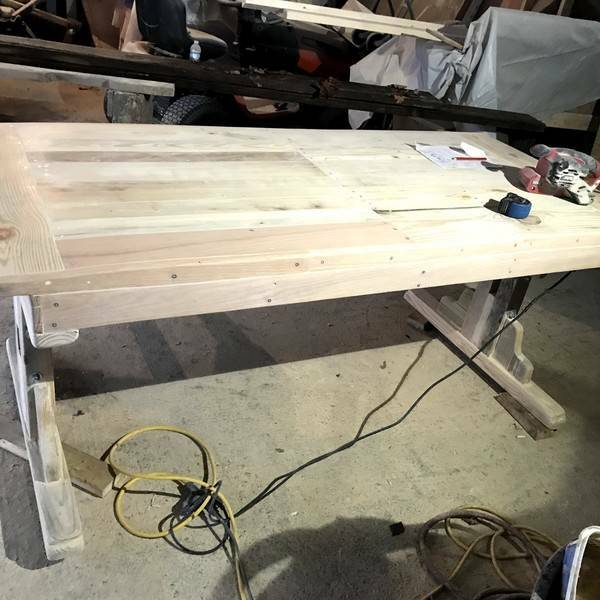 I also built two benches, 14 and 1/2 inches wide x 62 inches long. I love building things with my own hands instead of buying them. This DIY project of mine cost only a few dollars. 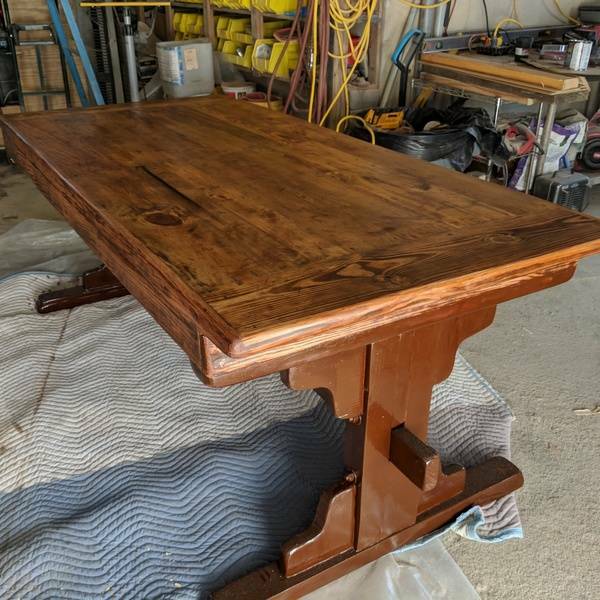 I did buy stain with the polyurethane in it for that beautiful shine and to seal wood and screws. I had sandpaper, paint brushes and cheese cloth. As far as other materals, when I worked construction, I gathered any materials left over from the job site. I was given the name title, "The Dumpster Diver", because I went through it every morning before they took it off to dump. 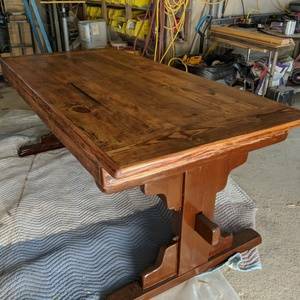 As I wrote, I love building things with my own hands, if you look closely at the table I made, there is a heart ingrained in the wood. When I saw it, I thought, " how appropriate". Handihands - The Dumpster Diver Recycler! I made the farmhouse table and benches from commercial pallets. I was able to make these from pallets I got from the construction site. The superintendent was glad to get rid of them as it saved the company money so they didn't have to fill their dumpster with them and pay to have them hauled off. I dismantled several pallets for the top of table but used two pallets for base and put these together with metal plates on the insides underneath and on sides so this secured them. I used 4x4's that the construction company used to separate pipes to make the legs on table and legs for benches. The long pallets had plenty of 2x4's so these were used for top of seating as well as legs. I was also able to get several 2x6's from these pallets to make the bread broads on the end of table. 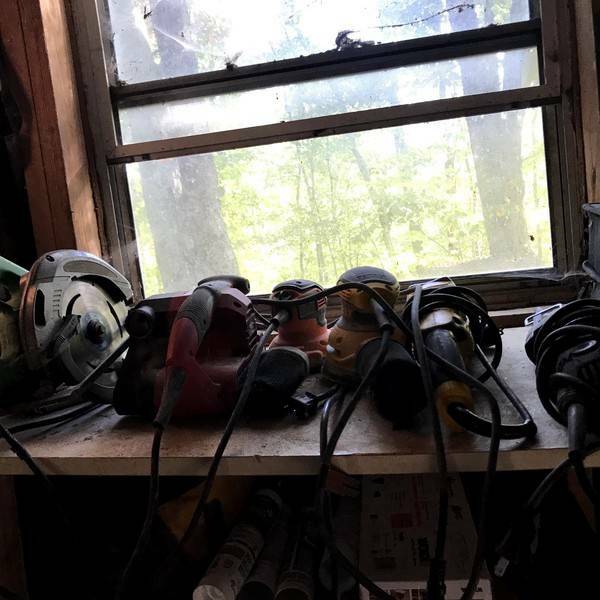 The tools Iist for this project we're a screw gun, circurlar saw, electric drill, jig saw, grindet, palm sander, and a belt sander. I used Elmer's wood glue, 2 1/2 and 1 1/5 inch screws to put everything together. To seal and give the wood the color I stained and paintd it using a chesnut polythene stain. This was a long process as it takes several coats to get the finished product the color I wanted. 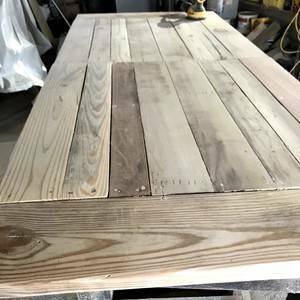 I stained the table and benches a using a brush then wrapping it with cheese cloth to get lighter color on wood then i applied a darker color of polythene by brush painting wood several coats. I used the pawm sander with a 220 sand paper in between coats and steel wool to get a smooth finish on both table and benches. Ii retired from retail after 42 years then went to work in construction. Yes, girls can drive heavy equipment as well as other task like caulking, painting, etc. Anyway, during a brief downtime at lunch one day, i spotted a stack of pallets. I ask the superintendent what they were going to do with them. I've always been into recycling and these pallets gave me all kinds of possible ideas. 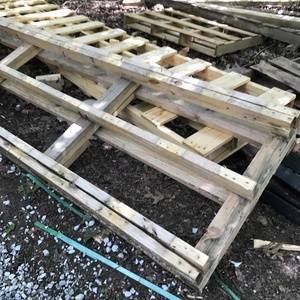 I had even checked out pinterest and and thought if only i could get my hands on some of those pallets. well.. I spoke with my husband then talked him into helping me get them home. Over the winter I've been very busy. The table I built including bread boards is 37 1/2 inches wide x 83 inches long. 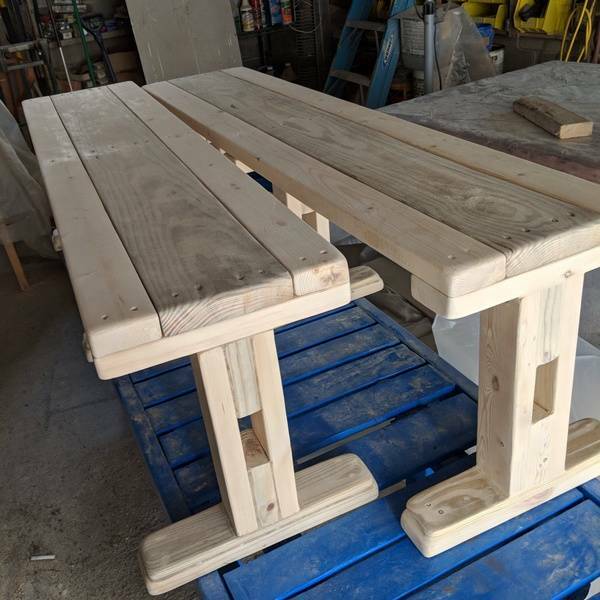 I also built two benches, 14 and 1/2 inches wide x 62 inches long. I love building things with my own hands instead of buying them. This DIY project of mine cost only a few dollars. 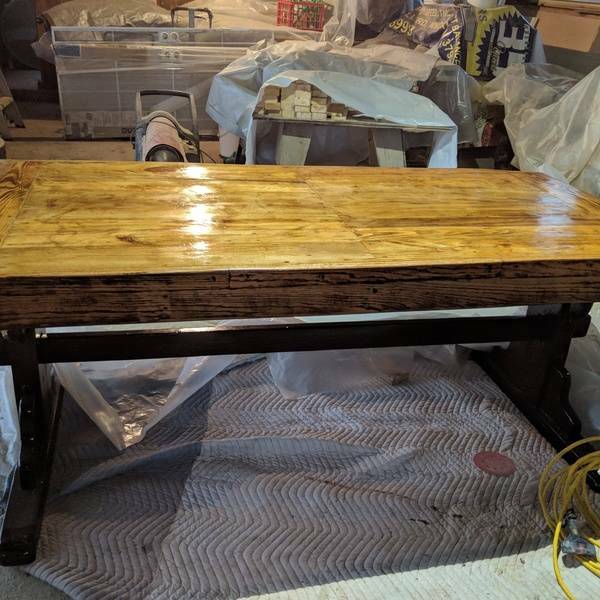 I did buy stain with the polyurethane in it for that beautiful shine and to seal wood and screws. I had sandpaper, paint brushes and cheese cloth. As far as other materals, when I worked construction, I gathered any materials left over from the job site. I was given the name title, "The Dumpster Diver", because I went through it every morning before they took it off to dump. 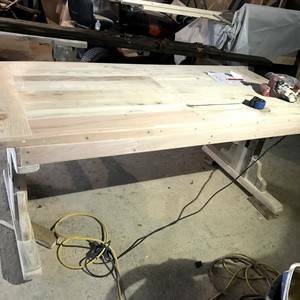 As I wrote, I love building things with my own hands, if you look closely at the table I made, there is a heart ingrained in the wood. When I saw it, I thought, " how appropriate". Handihands - The Dumpster Diver Recycler! I made the farmhouse table and benches from commercial pallets. 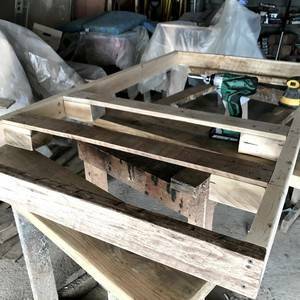 I was able to make these from pallets I got from the construction site. The superintendent was glad to get rid of them as it saved the company money so they didn't have to fill their dumpster with them and pay to have them hauled off. I dismantled several pallets for the top of table but used two pallets for base and put these together with metal plates on the insides underneath and on sides so this secured them. I used 4x4's that the construction company used to separate pipes to make the legs on table and legs for benches. The long pallets had plenty of 2x4's so these were used for top of seating as well as legs. I was also able to get several 2x6's from these pallets to make the bread broads on the end of table. 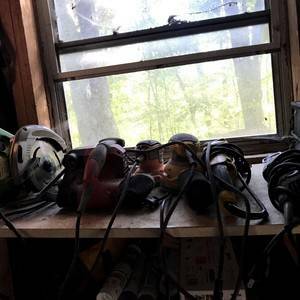 The tools Iist for this project we're a screw gun, circurlar saw, electric drill, jig saw, grindet, palm sander, and a belt sander. I used Elmer's wood glue, 2 1/2 and 1 1/5 inch screws to put everything together. To seal and give the wood the color I stained and paintd it using a chesnut polythene stain. This was a long process as it takes several coats to get the finished product the color I wanted. 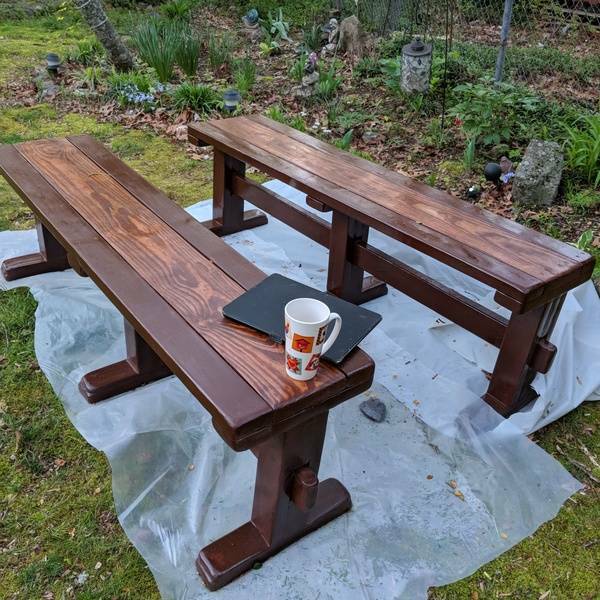 I stained the table and benches a using a brush then wrapping it with cheese cloth to get lighter color on wood then i applied a darker color of polythene by brush painting wood several coats. 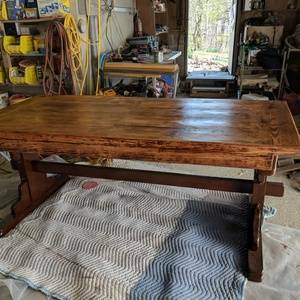 I used the pawm sander with a 220 sand paper in between coats and steel wool to get a smooth finish on both table and benches.